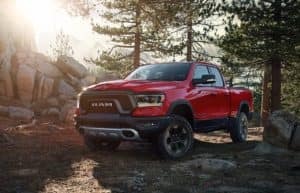 For a truck that’s suited for work and play, visit Landers Dodge Chrysler Jeep® RAM, where our Bossier City RAM dealers are excited to show you the 2019 RAM 1500. There have been some slight changes to this year’s model and you can feel it in the drive and sense it in the towing capabilities. If you’re interested in a superb pickup truck with a luxurious interior, visit our dealership for more information. Whether you need a luxury truck or a work truck, the 2019 RAM 1500 will accommodate your needs. It is true that this year’s new RAM truck is much lighter. Choose from an array of body styles, bed lengths, and powertrains. There are seven trims available, and a 3.6-liter V6 engine rated at 305 horsepower and 269 lb.-ft. of torque comes standard under the hood. For more torque, ask our RAM dealers near Shreveport, LA about the V8 engine. Your passengers will enjoy the smooth and comfortable ride of this new RAM pickup. Come step inside its attractively designed interior with its spacious rear seats and vast leg room. The 2019 RAM 1500 is an excellent car to own and a safe one, in fact. When visiting our Bossier City RAM dealership, you’ll learn more about the advanced safety equipment and special features that come loaded in these available trims. A rearview camera, automatic headlights, and trailer sway control come standard with the base trim. However, when you upgrade to higher trims, you are awarded automatic wipers, blind spot monitoring, and rear cross-traffic alert. While a 5-inch touchscreen and Bluetooth® connection come standard with the base trim, you are more than welcome to get your pickup truck loaded with Android Auto™ and Apple CarPlay™ smartphone integration and leather upholstery. Make your way to 2701 Benton Road, where our friendly staff is eager to help. Our Bossier City RAM finance center is thrilled to run your credit report and determine a comfortable financing plan so you can take home this new RAM pickup truck. If you’re not here for a vehicle, head to our service center to get an oil change or your fluids topped off. We hope to see you soon!